If you'd like to see some of the many ways US Presidents have interacted with our beloved Rock Creek Park, a video of Crestwood Citizens Association Historian David Swerdloff's February 2018 multi-media presentation for Rock Creek Conservancy is now posted on YouTube. Within the talk, there is a video that didn't load. The film shows Teddy Roosevelt and his party being carried across a stream in Kenya...in contrast to the legendary tales of him skinny-dipping in Rock Creek. The February 2018 edition of The Crest is being delivered to Crestwood homes now! View it online here for an article about Crestwood's 300 years by David Swerdloff, a discount code for Super Soccer Stars classes in Crestwood, a call for youth entertainers for a May Food Truck event, and much more! Please note that there is a sinkhole in the woods between 18th and Quincy and Crestwood Drive, NW at The Point (see video below) caused by a collapsing corrugated drainage pipe from Quincy Street/Crestwood Drive going down to Piney Branch. The area has been taped off and fencing should be installed shortly. National Park Service is aware of the situation and is developing a plan on a long-term solution. Please use caution when walking in these woods. It is with great sadness that we inform the Crestwood community of the sudden passing of our neighbor and the co-owner of Wagtime, Lisa Schreiber. Lisa passed away on Wednesday from acute pneumonia. Please click here for a statement from Wagtime and information on arrangements and a candlelight vigil celebrating her life and accomplishments on Monday January 22. Our thoughts are with Ofer and Lisa's family. Thank you to the neighbors that came out yesterday for the January 2018 joint SMD 4A08/Crestwood Citizens Association meeting! Turnout was low, but we met a new Crestwood resident and also got to spend some time with our invited guests. The meetings are fun and informative and we hope that more neighbors take the time once a quarter to participate in Association meetings. We were so happy to have PSA 404 Lieutenant Frank Martello talk to us about crime in PSA 404 and in Crestwood, and to answer questions. As a reminder, you can always find Crestwood crime stats and information here. December's crime stats can be found here. Lt. Martello provided his email address (francis.martello@dc.gov) and telephone number ((202) 731-2493), and noted that while residents can contact him with any questions or to discuss any issues, if you see a crime or suspicious activity in process, it's always better to call 911. Calling 911 to report suspicious activity serves two purposes: 1) MPD can send a car out and possibly stop a crime or arrest a suspect; and 2) it lets would-be thieves know that the neighborhood is watching. Commissioner Black noted that at times in the past when there has been an uptick in crime, sending a signal (by calling 911 to report suspicious activity) has resulted in a decrease of crime. (Please note, when we talk about suspicious activity, we are talking about things like someone walking down a street peering into each car or trying door handles - simply walking down a street is not suspicious activity). Auto thefts: PSA 404 as a whole has seen an uptick in stolen automobiles. Lt. Martello noted that while this is concerning, it is important to note that a good portion of the "automobiles" that are stolen are actually mopeds or motorized scooters (not Vespas or the like) because those are classified as "automobiles." Another portion of stolen automobiles, especially in the winter, are cars that residents are warming up - when would-be thiefs see an unattended vehicle running, it's a crime of opportunity. Another crime of opportunity is car break ins - if a would-be thief sees even an empty box or bag in the car they will break a window and see if there's anything in it - they can do this in under 10 seconds. Often times (but not always) home burglaries result from an unlocked basement window - make sure to lock your doors and windows. Lt. Martello said that he was going to check in on the status of some of the burglaries that have happened in Crestwood recently. Cecilia Lane, Watershed Protection Division, Department of Energy & Environment, presented the 60% design for a project designed to combat water runoff at the Carter Barron tennis stadium site. The idea is to get the water into the ground rather than have it go immediately into a storm drain. They want to capture 90% of the water from each rain even to redistribute water to ground. The don’t expect any road closures, and anticipate starting work in April, ending in September 2018. You can find more information about the project at https://doee.dc.gov/service/carter-barron-stormwater-retrofit-project and can contact Cecilia at cecilia.lane@dc.gov or at 202-535-1961. Crestwood neighbor Andrew Zimdahl presented a proposed resolution of the CCA regarding DC legislation that would create a carbon fee-and-rebate policy for Washington D.C. The legislation would phase in a fee for CO2 emissions with a corresponding rebate to DC residents, especially lower-income residents, intended in part to offset the cost of utilities. It looks like a key vote on this bill may come from our council member, Councilmember Todd. Andrew said that the legislation would mean 23 percent drop in carbon emissions, which would mean less carbon harming our lungs and our atmosphere, more investment into energy efficiency solutions, and a faster transition to clean, renewable energy sources. If you have any questions or would like to learn more, please email Andrew at az@honeydewadvisors.com. You can also learn more at carbonpricedc.org. Our last neighborhood plan was in 2007. We will be updating it this year. Please let us know what policies and actions are important to you. Commissioner Black detailed some of the areas we may want to focus on such as a trail to connect Crestwood to Mt. Pleasant and the residential zoning of Crestwood. But we'd like to hear from you as to what's important to you! A copy of Commissioner Black's SMD 4A08 Update, FY18 Budget Priorities, and neighborhood recommendations can be found here. FedEx and UPS drivers tend not to ring the bell when dropping off packages. Lt. Martello suggested contacting FedEx or UPS and telling them that you would like your bell rung. We may look into whether we can contact them as an Association. There's an area on Upshur where the parking signage is unclear - there is a No Parking sign with arrows both ways - Lt. Martello believed that meant there is no parking to the end of the block, but noted that parking in generally within the scope of DPW not MPD. We still need team leads for the Social Committee, Public Safety Team, and the DC Issues committee. If you would like to help out, please email info@crestwooddc.org. Have you followed the Crestwood Citizens Association on social media? Click the links at the bottom of this email to stay up to date in your news feed! We thank Pastor Wendy of Grace Lutheran Church for allowing us to use the church's meeting space. Pastor Wendy noted that the Holiday Diaper Drive collected around $400 in diapers for the Greater DC Diaper Bank! This past Monday, the Crestwood Green Team held an invasive ivy clean up event where about 30 neighbors cut ivy from about 70 trees. Kudos! Every Fall there is a Crestwood Homes Tour to benefit Thrive DC. It is a fundraiser that depends on neighbors to open up their homes to help those without homes. An overview of CasA Crestwood 2017 can be found here. If you are interested in learning more please email Denise Woods at woodsassoc@gmail.com. The Association's Aging-In-Place Action Team, as one of its initiatives to assist older adults remain in their homes safely, connects neighbors that have volunteered to help shovel snow with older adults in the neighborhood that have requested such help. If you would like to volunteer to be contacted when there is a snow event to see if you are available to shovel snow for a neighbor, please send an email to the Aging-In-Place Action Team at olderadults@crestwooddc.org. Please note that this initiative is distinct from and supplements the District's Resident Snow Team. Additional safety tips for older adults can be found here. Earlier this year an expanded list of recyclable items was announced in the District. While residents serviced by the Department of Public Works (DPW) have been able to recycle the new items for several months, starting on January 1, 2018, all residential and commercial properties—including multi-family dwellings, office buildings, and restaurants—will be required to recycle this full suite of materials. And to make things simple, the items that should be recycled are now uniform throughout DC—whether you’re at home, work, or school. The District strives to achieve a goal of diverting 80 percent of citywide waste from landfills and waste to energy facilities. The increased number of recyclable items and focus on resident education aims to assist in achieving this goal. New items added to the list of recyclable items in the District include: pizza boxes; paper and plastic plates, cups, lids, and to-go containers; plastic produce, deli/bakery containers, and trays. Through the addition of these items, the District joins a select group of cities that accept foodservice packaging for recycling, thereby supporting the development of local and national solutions to recycling new materials. As a reminder, plastic bags, wraps, and film are not accepted in the District’s recycling. These items clog facility equipment, imposing downtime and safety hazards to recycling facility employees. Many supermarkets and large retailers have plastic shopping bag return/recycling bins in their stores. Residents are asked to place recyclables into their blue bins loose, or in paper bags. For more information and resources related to recycling in the district, please visit zerowaste.dc.gov. The Mayor’s List of Recyclables was developed following a survey of eight material processing facilities (MRFs) within a 45-mile radius of the District. Materials added to the list were accepted by a majority of MRFs in the region. The Mayor’s List is a requirement of the Sustainable Solid Waste Management Amendment of 2014. The purpose of which is to provide a single comprehensive list of recyclable and compostable materials for DC residents, schools, and businesses. Kathy and Arthur Frank hosted a joyous Santa Meet and Greet, where kids and parents mingled and took photos with Santa. There was a stroller parking lot in their driveway, and it was great to spend time with so many Crestwood neighbors! The 2017 Crestwood Turkey Trot was the most successful yet! It was amazing to see so many neighbors and friends begin Thanksgiving by exercising for a good cause! In all, we had 199 people register for the Trot. 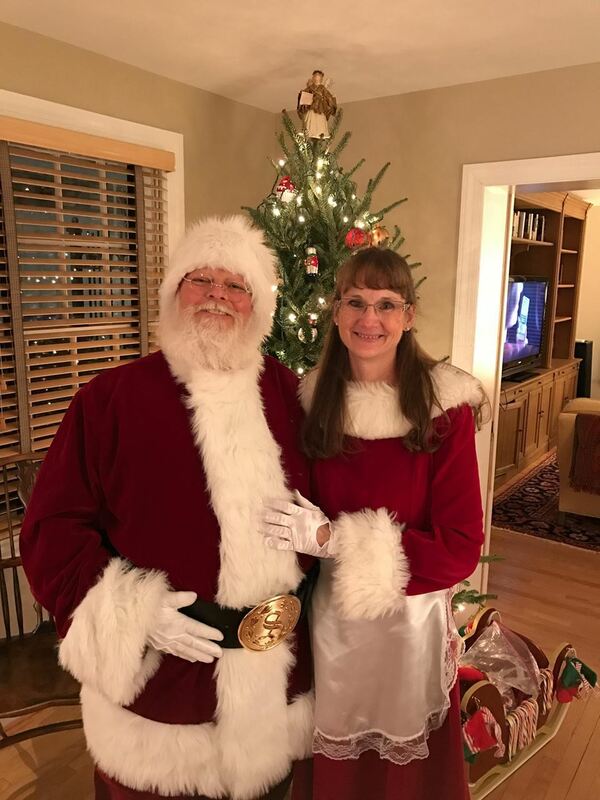 Thanks to everyone's efforts, we raised $2,710 for All Our Kids, Inc (AOK), a nonprofit organization that impacts the lives of District young people, and began in the home of Crestwood residents David Simpson and Kathy Fletcher. Congratulations to Max Bank for running the fastest 1 mile recorded (8:08). And to Michael Earls for running the fastest 5K recorded (18:30). The finish times as self-recorded for the 1 mile and 5k can be found here or at https://goo.gl/ZmYVqs - apologies for any misspellings. 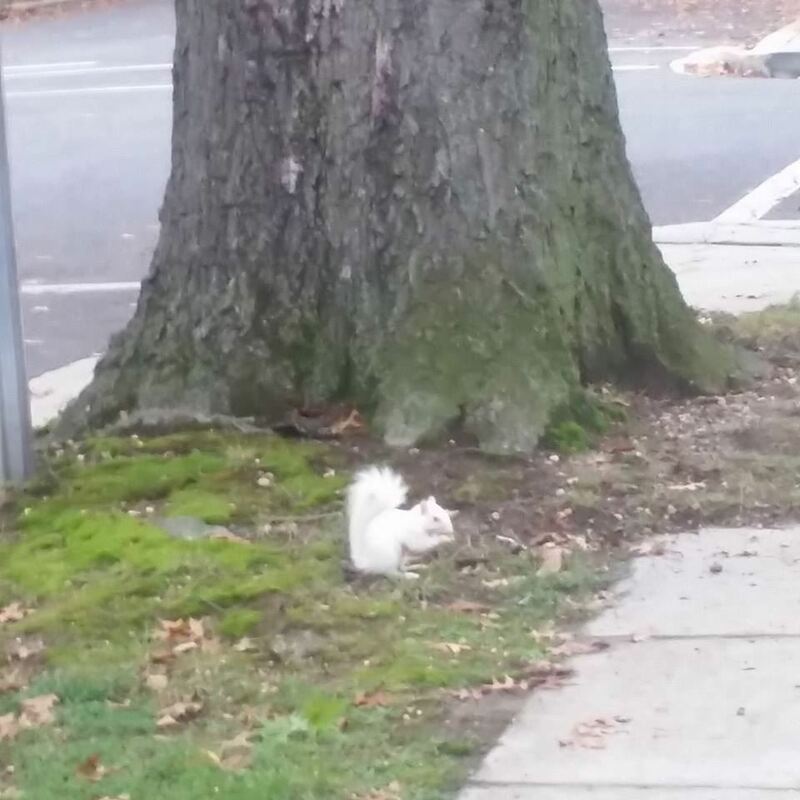 Many people have spotted the albino squirrel living off of 17th St between Taylor and Varnum over the past 3 weeks. It's not the best photo, but still pretty neat as this is rare. 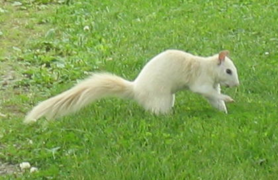 Although these squirrels are commonly referred to as "albinos", most of them are likely non-albino squirrels that exhibit a rare white fur coloration known as leucism that is as a result of a recessive gene found within certain Eastern gray squirrel (Sciurus carolinensis) populations, and so technically they ought to be referred to as white squirrels, instead of albino. A true albino squirrel. Note the pink eyes. 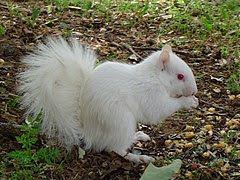 A white squirrel. Note the non-pink eyes.